My admission of guilt, my mea culpa, when I was called on the carpet for supposedly disclosing "dangerous secrets" of the craft, was met with a huge thud at the Institute and rejected -- not enough, they said! After I humbled myself in abject servility, putting everything on the line, my pride, my self worth, my dignity, just so I might be in the good graces of the Great Ones, the Lordly Poobahs, (wastrels, no doubt), self-appointed as the high and mighty, acting as gatekeepers, protectors of the sacred flame, as it were, of mental parasitism! That's the way it usually is -- Am I right? -- with those who cannot be questioned, those who dwell in ivory towers, so far above the rest of us mere mortals. They always want you to jump just a little bit higher, or grovel just a little bit lower. They can't be bothered to specify precisely what they want. Then you try to contact them, and naturally they're out of the office, busy with some other important task, no doubt, perhaps roaming the world hobnobbing with their fellow grandees and looking for others to censure. That very well could be true, because there's hundreds of MP practitioners, and most of them, like me, are independent types. When I first heard of this matter, I immediately figured they were out to get me, and that their means would in all likelihood be devious. Because I'm a plum, you see. I'm a ripe plum out there for the picking. With a popular blog and influence that stretches around the world. Who would be a juicier plum for them, with all that plus my personal mojo and verve! They're always on the lookout for guys like me, the gifted and skilled. They're insecure! They want the mental parasitism powers I have, to absorb them and pluck me off the vine, thereby keeping themselves stronger. And this goes for others like me. They have us belonging to their rather unholy club -- that's our validation, in a sense, because there's always the enhancement of one's practice through being part of a dedicated group. Why else would we submit to these scurvy monkeys? So it's times like these, frankly, that I'd like to scream. When the Institute's receptionist says, "Dr. X can't come to the phone right now; he's in conference." I bet he is! Rubbing his grubby hands together in jealousy and lust along with the rest of the criminal element of the Institute, authority run amok. Willing to take our dues -- of course! -- sucking up to us when it's renewal time, then despicably dumping on us (plenty of dissing) the rest of the year! I ought to--- I really ought to -- Don't get me started, OK? But a guy thinks, "I could do this better with one hand." I could run the organization better. I'd treat the membership with respect. No more censures, no more increased dues when there's the slightest controversy, trying to keep people in your thrall, keep them over a barrel, always demanding they measure up, make them meet your stinking standards. Because mental parasitism isn't a matter of standards, it's a way of life, in my opinion, best determined by the practitioner himself. I'm this close (inches) from starting my own Institute! I know there's surely hundreds of guys (and gals, in the Auxiliary) disgruntled like me. It's just a matter of making contact with them, getting the word out. Say I went on Twitter, which has its downside because it's so public. Or we could get together on one of those sharing sites for documents. "Here's my idea." "That's a great idea, here's mine." "We've got two pretty good ideas, let's see if someone else wants to join us." Bam, you've got a brand new Institute! If that's what I'm going to do, I'll probably have to be like the Declaration of Independence guys, and come up with a page of grievances. That we cannot work through this, that, and the other thing, no matter what we do. Then mail letters to some of the other disgruntleds, saying, "Let's get it on!" 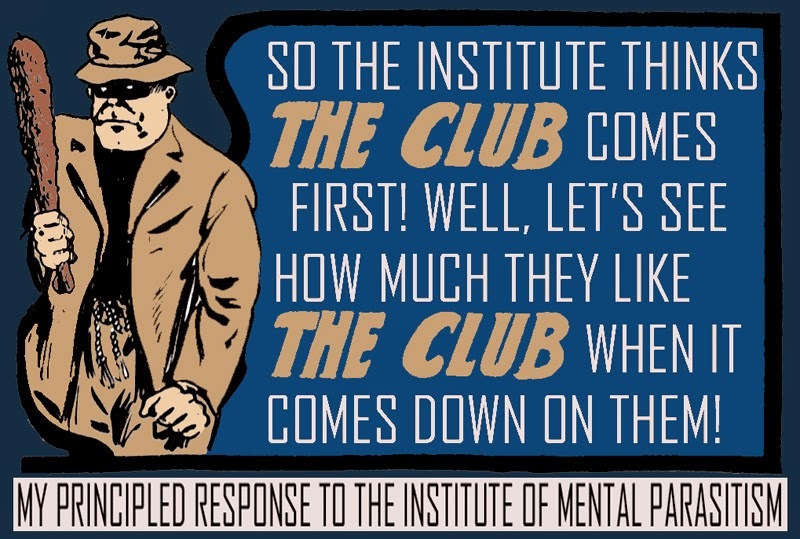 And have our own Mental Parasitism Institute, where there's absolutely no rules, or fewer rules. Such as the "Do as little harm as you can" rule. If I want to reduce a dozen or even a hundred mentally alert victims to a writhing, unconscious, naked mass, like hideous snakes in a pit, that's my business! No ethics, no nothing. Do it yourself. Come up with it on the fly. Of course we'll want to stay out of each other's way as much as possible. And hold to a few common sense standards of conducting business. Like watching out for each other's well being. Good stuff. Then, say, someone does go off the beam and threatens the common well-being, I can see how that would be a definite negative. Do we stand together or do we fall? Do we hang together or separately? In short, we need a few helpful bylaws for our common congregate discipline, so everyone stays on the same page as much as possible, for everyone's mutual good. And I see it, if someone goes way too far, such as literally sharing the deepest secrets over the express objections of the group, he should be called on it, brought to heel. I feel that we will flourish the most when we remain together, sharing the teachings and maintaining a sweet spirit of camaraderie. If only the current Institute felt the same way. Why Are Chefs So Horrible? Take the Thanksgiving Pledge: I Shall Shop!